(Dette er den fjerde artikkelen i en serie på fem om avanserte strategier i SSP i forkant av årets NM 10. desember, skrevet av verdens største stein, saks, papir-stjerne - amerikanske Master Roshambollah. Les del én her, del to her og del tre her). All of this happens before noon, six days a week, for Markus Thonhaugen, current President of Norsk Forbund for Stein Saks Papir (NFSSP, the Norwegian federation for Rock Paper Scissors). No one could accuse Markus of undertraining to compete in the world's most demanding hand sport. There was a time in professional Rock Paper Scissors (RPS) when players would pass around photocopies of my tract "Elite Training Methods for RPS Athletes", which first introduced the idea of periodized training, strength and conditioning drills, etc, to the sport. Markus has clearly taken training to another level. As I settled into a chair in his office, he offered me a steaming cup of bone broth mixed with yak's blood. he offered, by way of explanation. Markus in action during the RPS World Championships. Markus pulled out a box and showed me a few of his "failed experiments", RPS training devices that didn't make the cut. These were things like individual finger weights in 2 gram increments, variations on the classic "eagle catcher" hand strengthener, and a massive pair of scissors that required one's full strength to close. – When I became President of NFSSP, I decided a new approach was in order. So many of our past Presidents had the look of sickly scholars. I'm not mentioning any names. 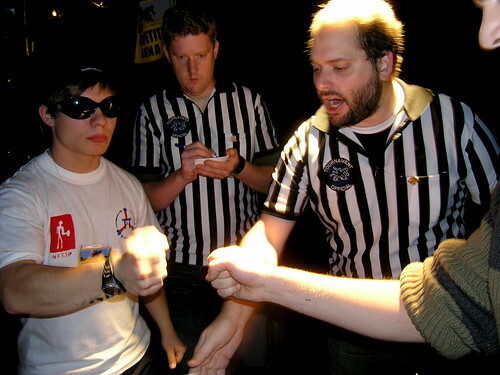 – Many are lured to the sport of Rock Paper Scissors for the fame, the glory, the easy money and the fans. And of course, those things are still there. But I introduced the idea of sport RPS, playing RPS with one's continued health and soundness of mind and body as the main goal. Which is not to say that Markus is not a fearsome competitor. 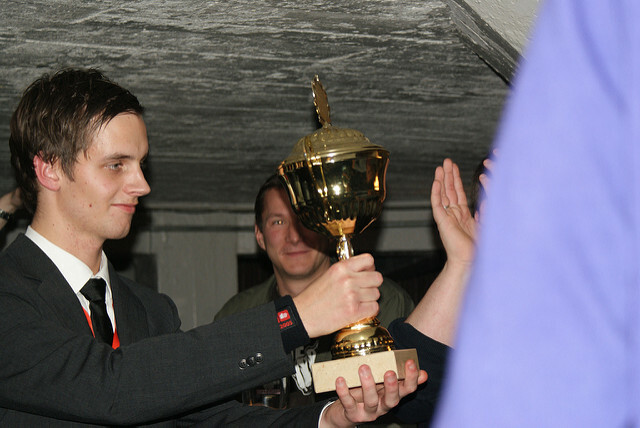 Eschewing international competition, Markus has devoted his entire professional career to competing in Norway, where he is known from Mandal to Svalbard as a "pick-up" player in various athletic clubs and bars. Still, his approach to training sets him apart from many others. Generally speaking, most professional RPS players prefer not to bulk up too much prior to competition, claiming it slows them down, or exaggerates their tells. Others point to some of the more esoteric martial arts, which claim that adding too much muscle spreads one's vital pressure points across a larger surface area, making one more vulnerable. None of these claims have ever been tested scientifically. I asked Markus about this, and whether or not he found any truth to the matter. He vigorously denied it. – It's complete nonsense. Though I do think everyone has a best body type for competition, and it can vary from person to person. – I feel that I play best when I've finished a bulking cycle and gotten down to around 12% bodyfat. Former president Pål «The Wall» congratulating Markus with his new presidency. Yeah, but doesn't the added bulk accentuate your physical tells, I asked him? A skilled player picks up on these tells after years of observation. One notices that certain players start to release a throw of Paper way too early, or that others will clench their fists tighter when they're planning on staying with Rock. Just after the count of three, as our fists started to descend, I noticed the lumbrical muscles associated with Markus' index and middle fingers were starting to tense; an unmistakeable sign that scissors is coming. Deciding to rub salt in the wound, I delivered my classic finishing move, the "no-look Rock", a flashy win for a flashy guy. I looked up at Markus' smiling face and then looked down to see him holding a perfectly formed palm-up Paper, giving him the win. «But how…» I asked, struggling to comprehend what I had just seen. was his surprisingly humble reply. Markus was known for his fast moves. Her he has delivered his paper way before his opponent has delivered his rock. But it wasn't all about looking at junk in his office and social niceties. I had some hard questions for him as well. For instance, out of three NFSSP presidents, why have all three been male? Where is the female presence in the sports' administration? – In the days before NFSSP, there was a smaller organization handling our Olympic RPS team. We weren't very skilled competitors in those days before Geir Arne Brevik, back in the 1970s and 80s. – There was a blood doping scandal that affected our men's team in the late 80s, and we lost our ability to compete for a decade. The women's team grew quite strong, as they had full access to the funds and training resources for both teams. – The men who still wanted to be involved in the sport naturally gravitated towards admin. Even after the ban was lifted, most of our administrators have been male, though that number is more even these days. – This is why the first Team Norway that was sent to the World Championships was all male. The women's team had been travelling internationally for years and were tired of it. They also wanted us to have a shot at the glory they experienced. Markus gets his prize after the national championship in '09. Who will get it this year?